KioWare for Android is available for free demo download. The free demo has a nag screen. To remove the nag screen, you will want to purchase a license. 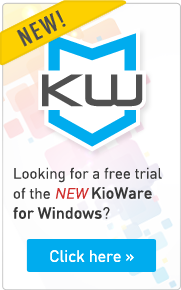 KioWare Lite ($45), KioWare Basic ($100) and KioWare Full ($120) - Kiosk Management Tools are sold separately. Once you have purchased KioWare, this video will show you how to license your device. The easiest and fastest way to license KioWare for Android is electronically, which means your device must be connected to the internet. Start by opening the KioWare Config Tool and clicking the License tab. Now click Get Electronic License. In the Transaction Number field, enter the License Transaction Number from your purchase information. Next, enter the Authorization Code, also from your purchase information. Below the Authorization Code, a KioWare product model will be listed. Check to make sure this model matches the model that was purchased – KioWare Lite, Basic, or Full. If you’re not sure, refer to your purchase email, License Certificate PDF, or user account to find the correct model. In this case, we’re licensing KioWare Full for Android, so we’ll choose KioWare Full. Click “OK” and your license will be activated.